Today we’re discussing a hot topic for online marketers in 2017, the importance of customer testimonials for your business. Data tells us that customer testimonials are extremely influential for consumers in the decision-making process and there are two primary reasons for this. With the evolution of social media and other online communities, consumers are trusting their peers over sales and marketing agencies when it comes time to make a purchase because it’s easy to do so. Secondly, millennials are leading the pack when it comes to the trend of “fact-checking” companies and doing extensive, yet accessible, research before making a purchase. This generation is the generation to dominate the purchasing market, therefore we need to pay attention to their behaviors. While we already see this referral based purchase trend happening, it is only expected to increase as the generation of millennials continue to take over. What weight does a customer testimonial hold? Customer testimonials show the value that your customer base sees in your products and service. There is simply no better way to communicate who you are than through a positive customer story, a genuine praise rather than a marketing ploy. In fact, 53% of B2B buyers rely on their peer recommendations to make purchases, it’s not just the case with the general public. Testimonials also rank highest by companies as far as marketing tactics go, at 62% usage in their marketing efforts, according to HubSpot. The reason for this high status is that customers will naturally convey the benefits in how they talk about your products, you don’t need to feed that element into their story. If they had success with your product, surely they will get to the “why”. Customers will also put their thoughts about your company and products in their own words which is helpful because often we miss unrelatable jargon that we use when it moves from internal communication to the customer. So, how do you get a testimonial, and what comes next? First, create a list of your top customers that you feel comfortable contacting about this. Next, reach out to them to ask them if they’d mind being featured in a testimonial. Lastly determine the elements of their experience you’d like to highlight, including any quotes and statistics you are able to get. When you can, position a customer testimonial of a specific product alongside that actual piece to create visual value for the prospect viewing it, even including a customer photo if available. After confirming that the content of the testimonial you’re featuring is acceptable with the customer, publish it everywhere that makes sense. Give your customer a shoutout or a handwritten card as thanks for featuring you. 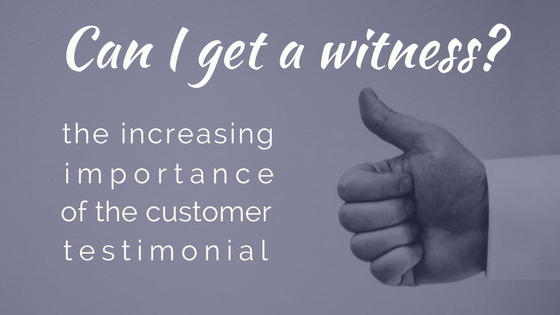 If you haven’t started the process of obtaining customer testimonials for your business, it’s never too late to start! Start making phone calls because this marketing element matters to your prospects and could just be the tipping point for a conversion.